A researcher from New Delhi, Dr. Jatinder Khanna has put together a first of its kind research with Siberia as a means for strategic and economic growth of Russia and thereby Asia. 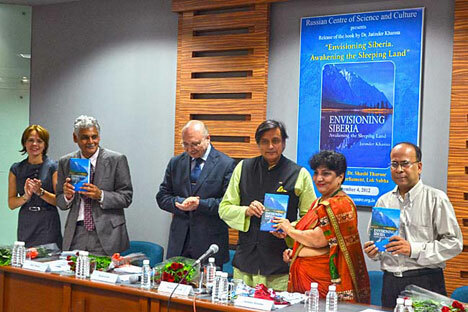 “What happens in Siberia affects the entire world,” asserts Dr. Jatinder Khanna, author of the recently published book ‘Envisioning Siberia: Awakening the Sleeping Land.’ She says it with a lot of faith and findings of more than two decades of continuing research on developmental trends in Siberia. “Rich in natural resources and strategically located; it has the potential to resolve the world’s most complex problems,” says Khanna, who in her book, establishes the significance of this region and also gives pointers to bringing it at the global forefront. Siberian territory turns out to be the key to the development of economic communications with countries of Asia-Pacific region. Siberia provides the most direct and fastest way to connect the main economic and productive parts of the world --- Europe, United States, North-East Asia and Central Asia, to emerge as the new frontier of development. Serious discussions are going on in the international community regarding the possibilities of Siberian resources, which can be mobilized on a global scale. The potential of Siberia’s pool of abundant resources, combined with comparatively inexpensive resources like skilled labor force, absence of any ecological restriction in the territory and the alluring possibility to gain access to transnational corporations. Khanna’s book is a substantial contribution to the limited information available on this subject. An emphasis on the socio-demographic dynamics makes it even more unique. An asset for researchers and academics, her work stemmed out of her fascination for objects of superlative degree. “In the early eighties I heard about the construction of the Baikal-Amur Mainline, an important branch of the world’s longest railway line connecting the world’s largest freshwater lake,” recalls Khanna. She wondered about the impact ‘the construction project of the century’ will have on Siberia and thus began her long association with the region. Through ‘several snowy calendar days’ in Siberia, she understood its people’s lives and challenges. “Siberians have quite a reputation for being aggressive and I also had my share of rough moments. But I could understand their circumstances,” she explains. Khanna survived the harsh weather, petty thefts, even travelled alone with an ominous drunkard in a Trans-Siberian coach, yet returned with a favourable impression. Khanna’s perseverance and patience culminated on ‘Socio-Demographic Factors in Siberian Development,’ several articles, lectures, seminars and now a comprehensive book. Her meticulous analysis, interpretation and systematic presentation of her findings affirm that Siberia is the new potential economic focus for Russia; this ‘sleeping land’ can develop into a major resource and energy producer, scientific and technological hub and a significant modern centre for not only Russia but also the World. Conditions in geo-political and economic-geographic position of Siberia have redefined its identity. The region, often termed as the “Asian part of Russia” is economically under-developed than the western part of the nation or the “European Russia”. Siberia is projected as the newly emerging economic and strategic hub of economic development in the Russia of the 21st century. Still, Siberian development continues to present Russian economic planner with a paradox about how to focus regional development policies. In order to develop the region, Siberia requires higher capital and labor inputs as compared to the more developed regions of Russia. Because of this paradox, the priority attached to Siberian development has been shifting fortunes of Siberia. Factors like ineffective resource utilization, shifting policy focus, lack of definition of developmental roles between the Federal government and its regional governments have all contributed to inadequate infrastructure and a ‘demographic catastrophe’. Thus, the region has eluded planners with the difficult challenge of utilizing its vast resources, including its fast depleting human resources. Developments in Siberia haven’t always turned out to be the way planners thought out to be, and the implications have always befallen on its people. Only from the end of 19th century its economic development started. In the 20th century, Siberia attained the most intensive development, transforming from an outlying district to an industrial and agrarian region playing a significant role in economic and the geo-political status of Russia However, Siberia’s destiny has been and will be tied to Russia’s. The ‘peopling’ of Siberia has been a contentious issue. The remoteness and ruthless climatic conditions have posed a challenge in the region’s development.